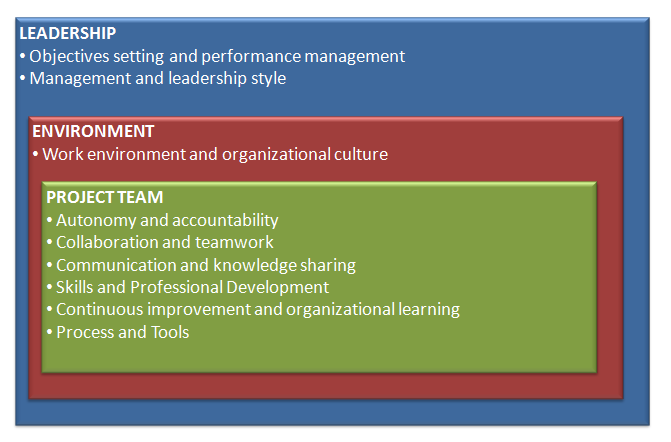 Following an earlier post on this topic and based on the increasing popularity of Agile Leadership, I have revisited my previous model with the experience we are gaining with the transitioning a large Canadian financial institution. Although the transition is still underway, our increasing experience is allowing us to improve the model. The fundamental objective of this model remains to increase return on investment (ROI) and employee satisfaction / motivation within the project teams while applying the 4 Agile values and 12 underlying principles. Leadership is stated as the “process of social influence in which one person can enlist the aid and support of others in the accomplishment of a common task” – Wikipedia. Goal setting involves establishing specific, measurable and time-targeted objectives – Wikipedia. Performance management includes activities to ensure that goals are consistently being met in an effective and efficient manner – Wikipedia. 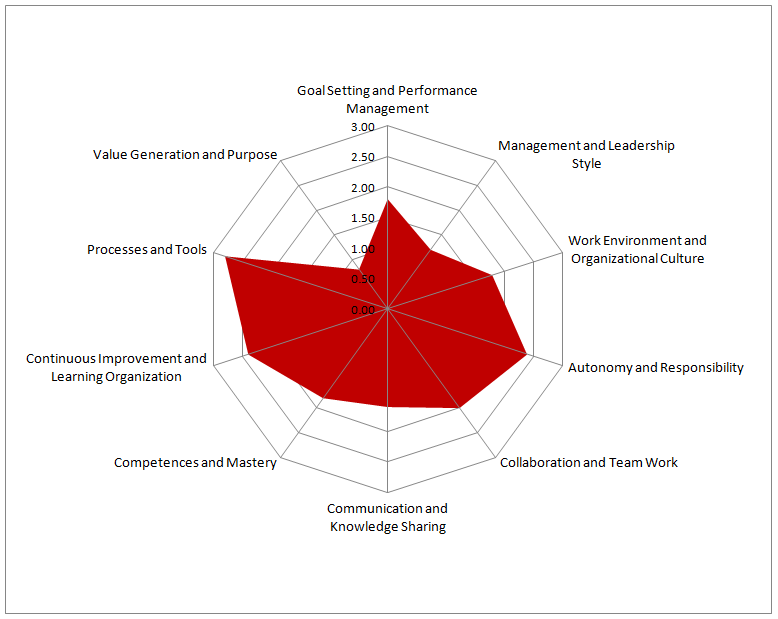 Evaluating the performance level of the project team, in addition to individual performance. Management in all business areas and organizational activities are the acts of getting people together to accomplish desired goals and objectives – Wikipedia. Leadership style refers to a leader’s behaviour. It is the result of the philosophy, personality and experience of the leader – Wikipedia. Surroundings are the area around a given physical or geographical point or place – Wikipedia. Organizational culture is an idea in the field of Organizational studies and management which describes the psychology, attitudes, experiences, beliefs and values (personal and cultural values) of an organization – Wikipedia. Providing hardware and software that reduces the costs and initial delays to start-up projects. A project team is a team whose members usually belong to different groups, functions and are assigned to activities for the same project – Wikipedia. Autonomy is a concept found in moral, political, and bioethical philosophy. Within these contexts, it refers to the capacity of a rational individual to make an informed, un-coerced decision – Wikipedia. Accountability is a concept in ethics and governance with several meanings. It is often used synonymously with such concepts as responsibility,answerability, blameworthiness, liability, and other terms associated with the expectation of account-giving – Wikipedia. Providing the necessary support when the team requests it. Collaboration is a recursive process where two or more people or organizations work together in an intersection of common goals – Wikipedia. Teamwork is work performed by a team – Wikipedia. Encouraging discussion and debate of ideas in order to bring out the best decisions. Communication is a process of transferring information from one entity to another – Wikipedia. Knowledge sharing is an activity through which knowledge (i.e. information, skills, or expertise) is exchanged among people, friends, or members of a family, a community or an organization – Wikipedia. Making relevant information visible to all participants. A skill is the learned capacity to carry out pre-determined results often with the minimum outlay of time, energy, or both – Wikipedia. Professional development refers to skills and knowledge attained for both personal development and career advancement – Wikipedia. Promoting training and development when the skills are not adequate. Continuous Improvement Process is an ongoing effort to improve products, services or processes. These efforts can seek “incremental” improvement over time or “breakthrough” improvement all at once – Wikipedia. Organizational learning is an area of knowledge within organizational theory that studies models and theories about the way an organization learns and adapts – Wikipedia. Reviewing the best practices to adapt to changing realities. Process or processing typically describes the act of taking something through an established and usually routine set of procedures to convert it from one form to another, as a manufacturing or administrative procedure, such as processing milk into cheese, or processing paperwork to grant a mortgage loan, or converting computer data from one form to another – Wikipedia. A tool is a device that is necessary to, or expedites, a task – Wikipedia. Ensuring that the team has set its own rules of operation. I am building and using this framework to help dissect the key components of Agile Leadership in order to help explain it to people managers and team members. Based on your experience, are there any dimensions missing? Face-to-face communication is the most productive way to share information. Needless to say, management hasn’t changed much in a hundred years with its need to control and its chief tools remain extrinsic motivators. Taylor believed that work consisted mainly of simple, not particularly interesting tasks and that the only way to get people to work on them was to incentivize them properly and monitor them carefully. Later on, Maslow developed the field of humanistic psychology in the 1960s (which questioned the idea that human behavior was purely ratlike seeking positive stimuli and avoiding negative stimuli) and McGregor challenged the assumption that humans are fundamentally inert (in the absence of external rewards and punishments, we wouldn’t do much). In his most recent book (Drive: The Surprising Truth About What Motivates Us – audiobook format ), Daniel Pink presents many factoids taken from scientific researches to demonstrate how people can (and can’t) be motivated. Although the author brings a scientific perspective to people motivation, the book is easy to read in addition to being entertaining. Scientists then knew that two main drivers powered behavior. The first was the biological drive (comes from within) and the second comes from without – the rewards and punishments the environment delivered for behaving in certain ways […] The third drive – performance of a task provides intrinsic reward. The joy of the task is its own reward. In his book, Pink states that human beings have an innate inner drive to be autonomous, self-determined, and connected to one another. The opposite of autonomy is control. Control leads to compliance; autonomy leads to engagement. Pink’s book provides valuable scientific explanations to the concept of self-organised teams. He presents the ROWE (Results-Only Work Environment) concept and the Self Determination Theory (SDT) to demonstrate the relationship between autonomy and well-being. He goes further to associate autonomy with higher productivity, less burnout, and greater level of psychological well-being. More closely related to software development, the author presents the level of authority given to employees at software giant Atlassian where people decide: what they do, when they do it, how they do it, and whom they do it with. The desire for intellectual challenge (the urge to master something new and engaging) was the best predictor of productivity. Daniel Pink explains that people are motivated by self-development and learning of new skills or developing existing abilities. The actual challenge of mastering a discipline is often a better motivator than money can be (assuming a minimal level of income). Similar to children who easily get motivated with playing – which is a way for them to learn and master a skill – managers can leverage that ability to motivate individuals. As such, human beings are said to have an inherent tendency to seek out novelty and challenges to extend and exercise their capacities to explore and learn – which are in themselves powerful motivators. The science shows that the secret to high performance isn’t our biological drive or our reward-and-punishment drive, but our third drive – our deep-seated desire to direct our own lives, to extend and expand our abilities, and to live a life of purpose. The author points out that many psychologists and economists have found that the correlation between money and hapiness is weak – that is past a certain level, a larger pile of cash doesn’t bring people a higher level of satisfaction. As such, contrary to traditional motivational techniques, money does not increase happiness and performance – some research have actually demonstrated the opposite effect! It is possible to keep people highly motivated without constantly leveraging money as a motivator. Human motivation seemed to operate by laws that run counter to what most scientists and citizens believe. When money is used as an external reward for some activity, the subjects lose intrinsic interest for that activity. Rewards can deliver a short term boost but the effect wears off and worse can reduce a person’s longer-term motivation to continue the project. In direct contravention to the core of tenets of motivation 2.0, an incentive designed to clarify thinking and sharpen creativity ends up clouding thinking and dulling creativity. Why? Rewards, by their very nature narrow our focus. That’s helpful when there’s a clear path to a solution. They help us stare ahead and race faster but “if then” motivators are terrible for challenges. The rewards narrowed people’s focus and blinkered the wide view that might have allowed them to see new uses for old objects. The can foster short-term thinking. Algorithmic tasks are tasks in which an individual follows a set of established instructions down in a single pathway to one conclusion. That is, there’s an algorithm for solving it. A heuristic task is the opposite precisely because no algorithm exists for it, individuals have to experiment with possibilities and devise a novel solution. Software development is a heuristic task. During the twentieth century, most work was algorithmic but as McKinsey & Co. estimated that in the United States, only 30 percent of job growth now comes from algorithmic work, while 70 percent comes from heuristic work. Researchers have found that external rewards and punishments – both carrots and sticks – can work nicely for algorithmic tasks but they can be devastating for heuristic ones. If you need scientific explanation and useful examples to explain to people around you why a self-organized (autonomous) team with team members who are striving to develop their skills in an attempt to reach a common purpose is possibly the most impactful motivator, you may want to read this book.